Pra Somdej Nang Kwak-Nang Paya Ongk Kroo Masterpiece Version 4 Gold Takrut, Ploi Sek Maha Pokasap Precious Gemstones, Gaesa (hair of Kroo Ba Krissana Intawano), and of course, Kroo Ba Krissana Intawano’s famous Pong Kammathana Muan Sarn Sacred Powders, The finest grade in highest concentration in this special, top of the range, masterpiece series model sacred amulet of excellence. 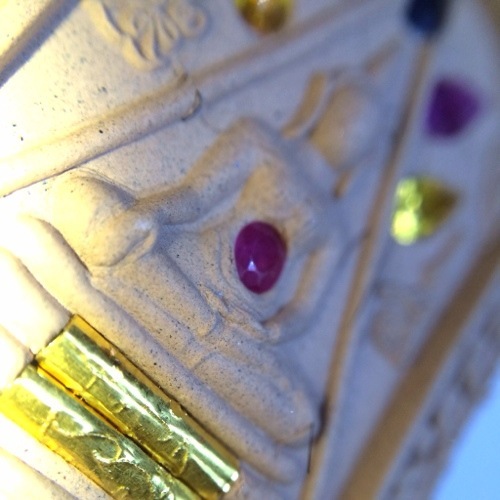 Three gold Takrut are visible on the outer surface (two on the front face, and one on the rear face), and as is the case with all sacred powder amulets from this Master, one further Takrut is hidden within the interior of the amulet. The objectives of Kruba Krissana Intawanoh’s 2556 BE edition include using the funds received, to donate to the commemoration of religious holy places and temples in and around Buriram, and to produce interest and build practice, in the Buddha Dhamma. The sacred Muan Sarn powders, were amassed together for the great Puttapisek ceremony, and under masterful eyes to ensure that the ritual followed exactly as prescribed by ancient Dtamra of Sorcery, according to the Kroo Ba Ajarn and Lineage Masters of Kroo Ba Krissana Intawano. 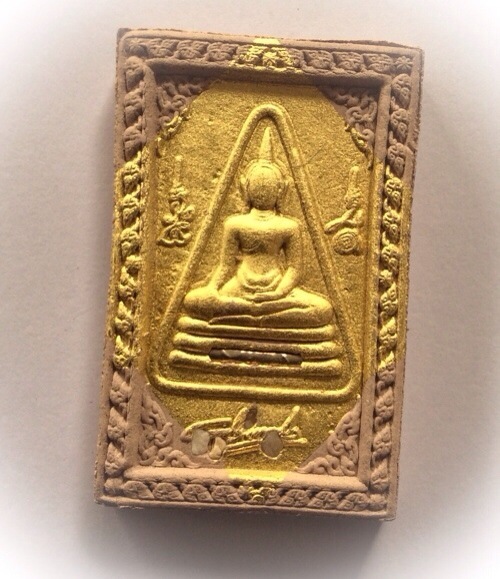 This Nang Kwak Pra Somdej combination is a most auspicious and powerful amulet created by Kruba Krissana for calling to millionaire riches as well as all general blessings of the most infamous Pra Somdej style amulet. 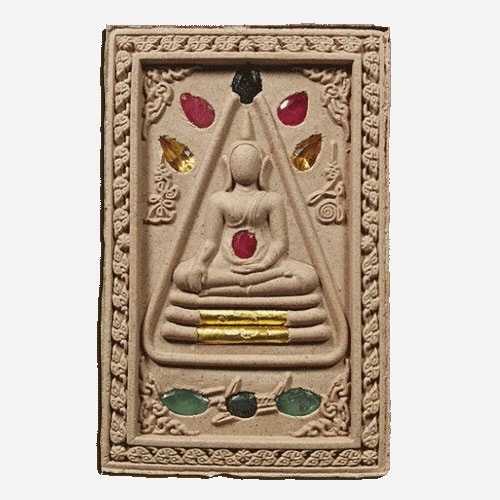 The amulet is entirely Kruba Krissana’s sacred powder base with one side imprinted with the Nang Kwak deity surrounded by holy angelic yantra specific to Kruba Krissana’s style and his imprinted signature rests in the base of the amulet. 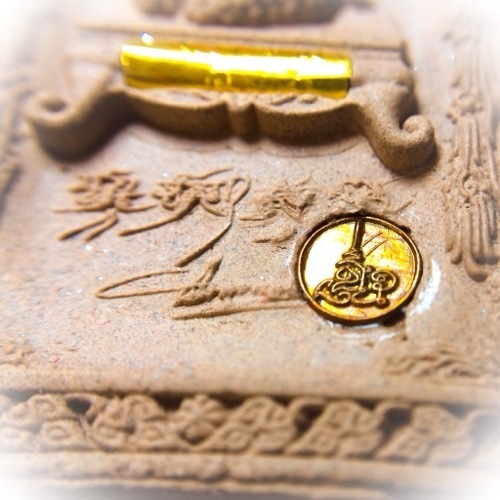 A sacred metal ‘Rian’ coin is inserted into the Muan Sarn base between Nang Kwak and a highly decorative Thai style floral border. Nang Kwak is a benevolent spirit. 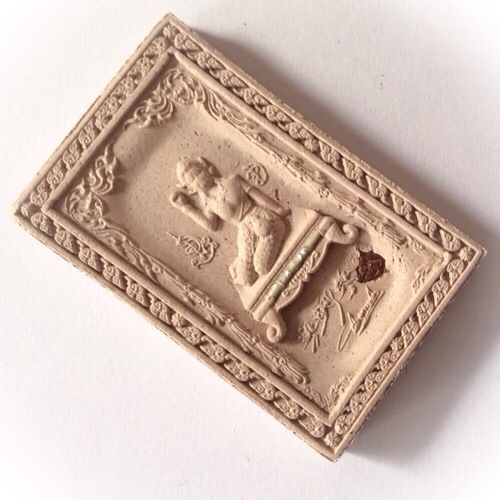 She is deemed to bring luck, especially in the form of money, to the household. 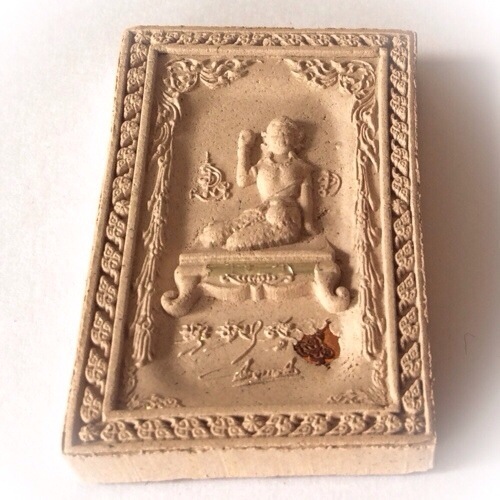 She is the patron Deity of all Merchants and Salesmen and can be seen in almost every business establishment in Thailand. 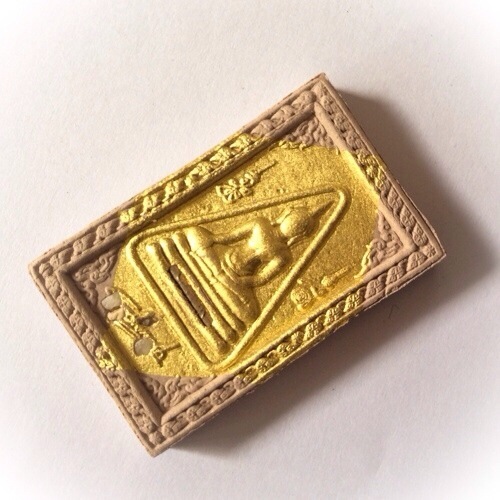 The Pra Somdej side displays the iconic image of the infamous Pra Somdej gilded in gold leaf with a silver takrut inserted into the Muan Sarn sacred powders along with 3 white Ploi Sek sacred enchanted gems sitting at the base of the Pra Somdej image. 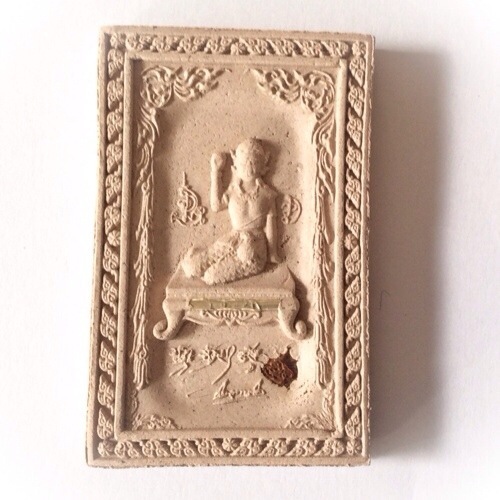 This side as well displays Kruba Krissana’s signature and the amulet is surrounded again by a highly intricate Thai floral border. 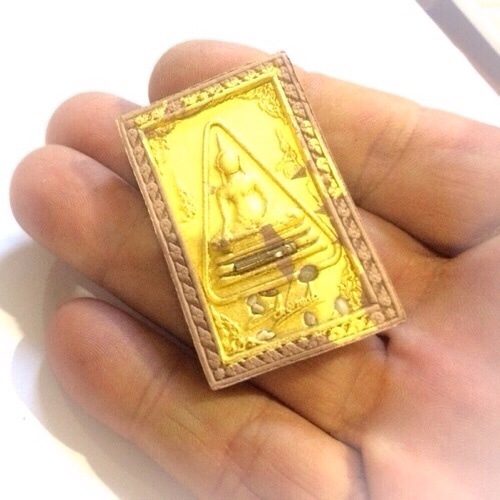 Pra Somdej Kwak Nang Paya Ongk Kroo Masterpiece Version 4 Gold Takrut from Thailand Amulets on Vimeo. The practice of praying to Nang Kwak was adopted by the Thais as Buddhism and the Brahmin faith came to Thailand, and is as proliferant today as it ever was in ancient times! The Brahmins, who are practitioners of Kata in a very big way, brought the statues of Nang Kwak here with them, changing the posture of the statue from that of a lady sitting on a cart, to that of a lady sitting in a shop waving to beckon customers. First of all before anybody, the Brahmins used it for their own business, but when they saw that people in Thailand believed in the powers of Nang Kwak, they began to make the statues here too, chanting and invoking the kata and blessing the statues to sell to other Thai Merchants for making Bucha. 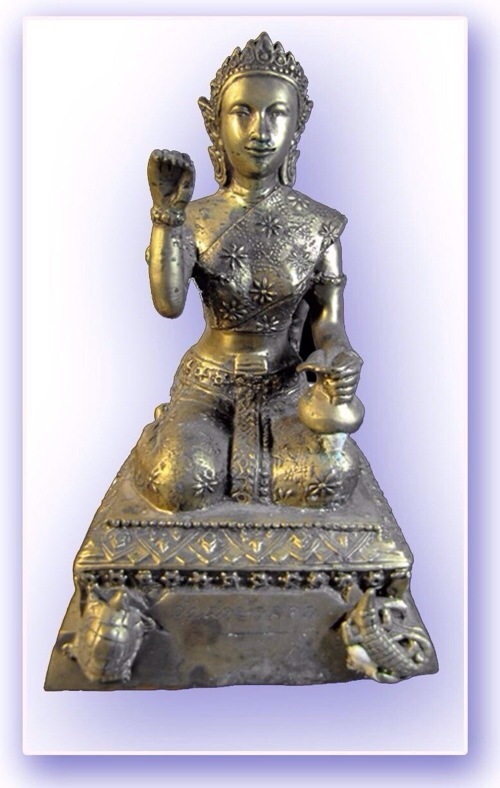 Nang Supawadee then received her new and more commonly know name, due to her sitting and waving position in the new statue form “Nang Kwak” (waving lady – Kwak means to wave and beckon with the hand). Light the incense, candles, and offer the flowers and drinks. Then Say “Namo Dtassa Pakawadto Arahadto Sammaa Samputtassa” 3 times, and bow three times to Buddha before you begin chanting Kata Nang Gwak. 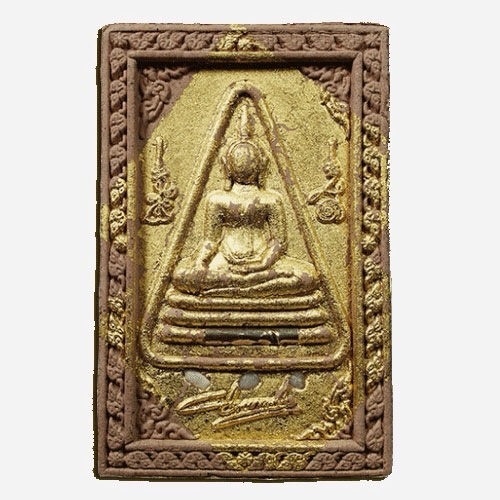 This Nang Kwak Pra Somdej combination is a most auspicious and powerful amulet created by Kroo Ba Krissana for calling to millionaire riches as well as all general blessings of the most infamous Pra Somdej style amulet. 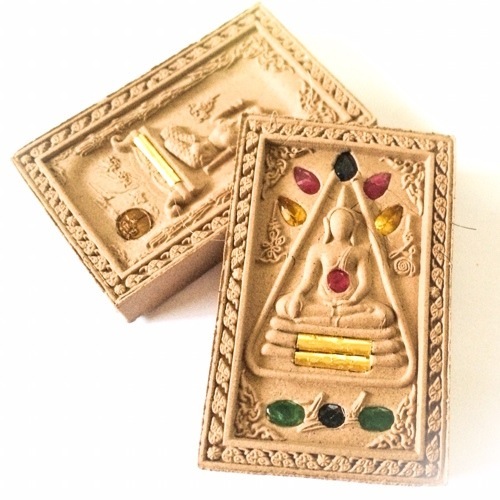 The amulet is entirely Kroo Ba Krissana’s sacred powder based with one side imprinted with the Nang Kwak deity, surrounded by holy angelic yantra specific to Kroo Ba Krissana’s style, and his imprinted signature, rests in the base of the amulet. 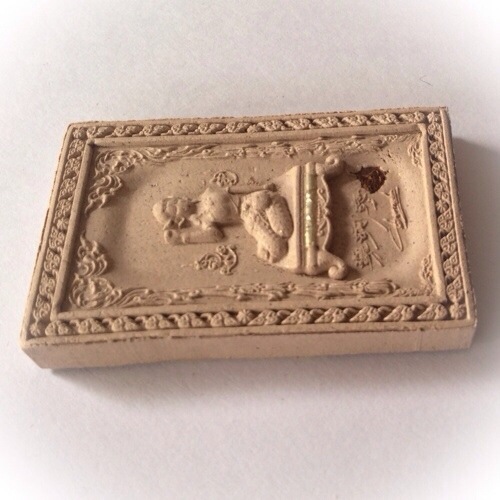 A sacred metal ‘Rian’ coin slug, known as a ‘look namo’, with a magical spell inside, is inserted into the Muan Sarn sacred powder base between Nang Kwak and a highly decorative Thai style floral border. 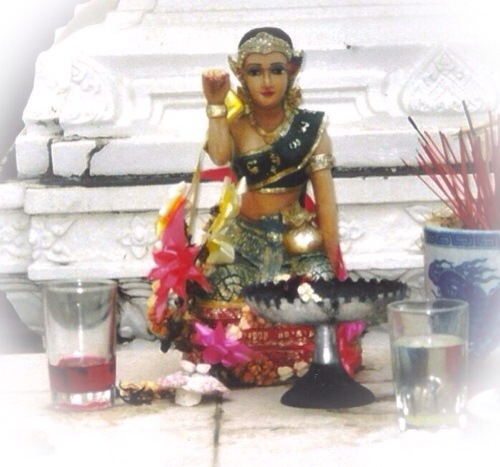 Nang Kwak is a benevolent female deity, was worshipped dates far back thousands of years to the pre-Buddhist era as Southeast Asia was permeated with Brahmanism. She represents the daughter of a wealthy travelling merchant who was lucky enough to hear dharma lectures, from two great Arahants (Mokhallana and Saributra), who were two of the closest friends and most popular practitioners of the Lord Buddha. It is said that the fact that she took delight in listening to the Buddhist sutra is from these two great enlightened beings caused her to absorb immense lucky Maha Sanaeh, Metta Mahaniyom, Maha Pokasap, and Maha Lap blessings. This caused her father’s business to become increasingly successful, to the point where they would not travel to do their trading unless Nang Kwak would also travel with them to market on the oxcart. Her real name was Nang Supawadee, and both Brahman and Buddhist people have been worshipping her, ever since the times of the Buddha, and the worship of this deity has become second to none in Thailand where one will see this deity sitting on almost every single market stall, and shop altar of the whole nation of Thailand. 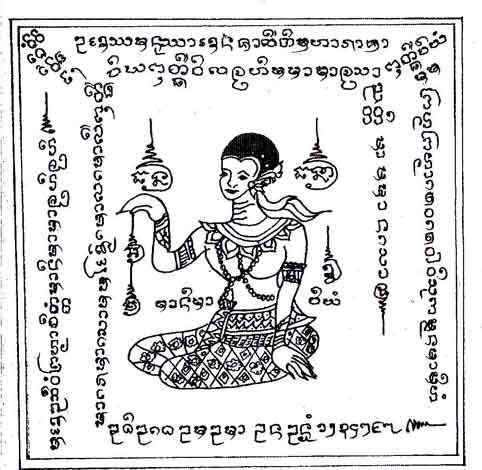 Before people had this Deity, her more ancient substitute, was to worship either Mae Toranee (Dharani/Mother Earth), or, Pra Mae Posop (The goddess of the harvest and fertility). 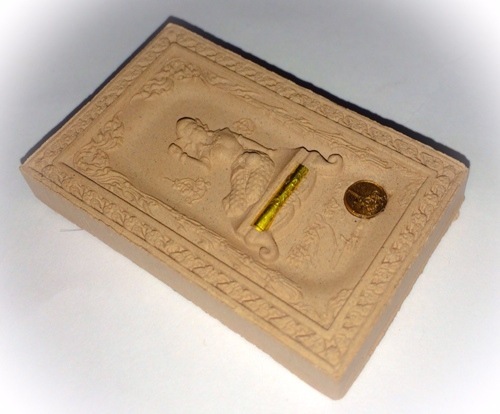 She is deemed to bring luck, especially in the form of money, to the household. 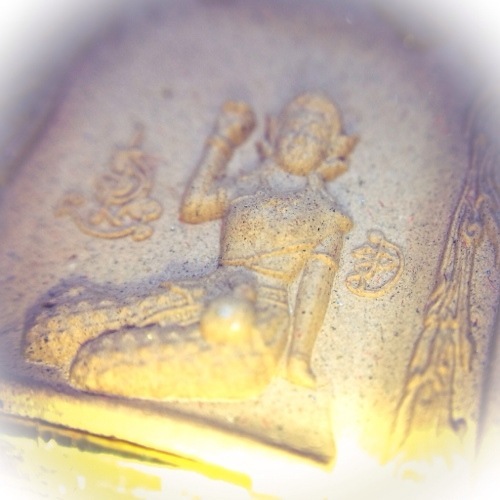 She is the patron Deity of all Merchants and Salesmen and can be seen in almost every business establishment in Thailand. 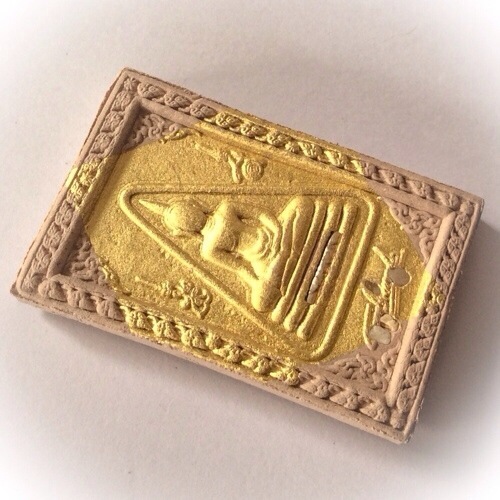 The Pra Somdej side displays the iconic image of the infamous Pra Somdej gilded in gold leaf with a silver takrut inserted into the Muan Sarn Earn sacred powders along with 3 white Ploi Sek sacred enchanted gems sitting at the base of the Pra Somdej image. 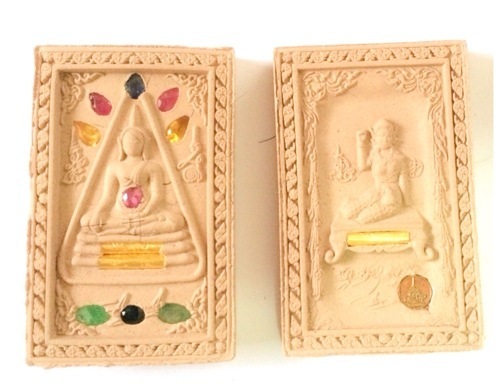 This side as well displays Kroo Ba Krissana’s signature and the amulet is surrounded again by a highly intricate Thai floral border. 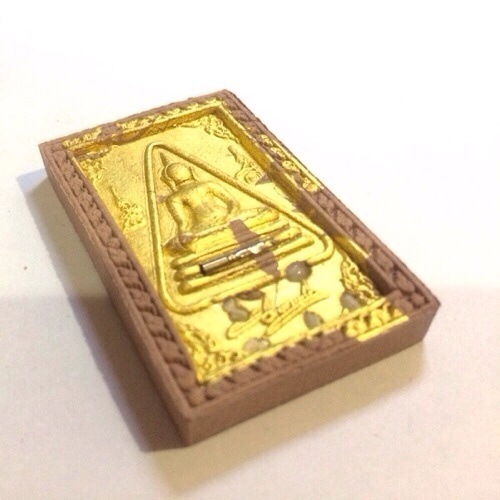 A Takrut spell is inserted into the dais, upon which the Nang Paya Somdej Buddha deity sits. The legend of Nang Kwak, is something that occurred a long time ago, before or during the time when Buddhism was beginning to spread, about 2500 years ago. The legend tells that, in the Indian province of Sawathee in the small town of Michigaasandhanakara (มิจฉิกาสันฑนคร)There was a married couple whose names were Mr. Sujidtaprahma (สุจิตตพราหมณ์ ) and Mrs. Sumanta (สุมณฑา), who had a daughter named Supawadee (สุภาวดี).They were merchants who sold small amounts of wares on the markets, only earning just enough to maintain their small family from day to day. One day, they were discussing their hopes and dreams for the future, and decided that they should try to expand their business to make more profit and begin to think of being able to save something for their old age; as a result of this conversation, they decided to try to afford to buy a “gwian” (cart) in order to use to travel with and sell their wares to other towns and villages, also then bringing wares from the other towns to sell in Sawathee and Michigaasandhanakara when they returned. Sometimes, Supawadee their daughter, would ask to tag along for the ride, and help them. One day, as Supawadee was helping her parents to sell wares in a distant town, she was lucky to be able to hear a sermon by Phra Gumarn Gasabatera (พระกุมารกัสสปเถร); she was so convinced, and moved by his sermon, that she took refuge in the Triple Gem. 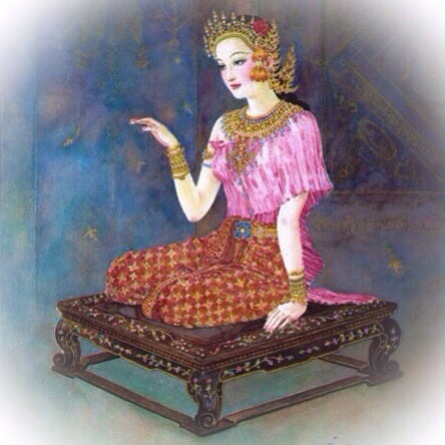 When Gasabatera saw her faith and devotion, he collected all his powers of thought and concentration of an Arahant* (for indeed Pra Gasabatera was and Arahant*), and bestowed blessings of good fortune and luck in salesmanship on Nang Supawadee and her Family. 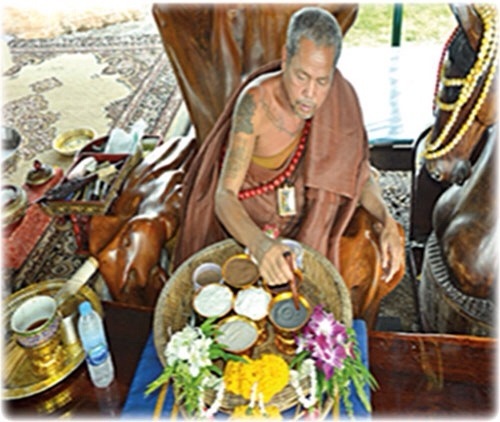 In addition, Pra Gasabatera increased the power for the blessing to make the magic stronger every time that Nang Supawadee would attend and listen to Dharma teachings with such devotion as she had this time. Nang Kwak In the next town they went to to sell wares, Nang Supawadee received the opportunity to listen to the preachings of Phra Siwaliitera (พระศิวลีเถร), who was also in the business of wandering around preaching the Dharma as taught by Lord Buddha Sakyamuni. Nang Supawadee received teachings from this master, and thus became extremely well versed and knowledgeable in Dhamma. Phra Sivali bestowed blessings of Metta upon her for her diligent efforts to follow and understand the practice of Dharma.Phra Sivali tera was different from normal beings and had a strange event marking his birth; namely that, he remained in his mother’s womb for a period of 7 years 7 months and 7 days before being born in the world.This cause Phra Sivali to be endowed with extremely strong mind powers, which, when he concentrated all his mental power and effort to bestow the Metta blessing upon the young Supawadee, the result was an especially strong effect to the blessing he gave. Due to these blessings gained from the two saints, it came to notice that every time Nang Supawadee came along for the rinde on her parents’ cart, sales were fantastic and all the goods were always sold in no time at all! As the when Nang Supawadee did not accompany them on their market sounds; sales were pretty meager in comparison. Her parents decided that their fortune would be best if they had their daughter Supawadee accompany them always on their sales rounds because they believed that the good fortune was to do with the blessings and merit she had with her. This brought such great fortune upon the family, that in a short time they became extremely wealthy merchants. Once they had already become pretty wealthy, Mr. Sujidtaprahma received the opportunity to hear some Dharma teachings from the Lord Buddha himself; he was filled with faith and reverence, and as a result of this, began to practice Dharma practice and reached the attainment of Sotapanna ( โสดาบัณ- Sodaban, in Thai) which is otherwise known as “Stream Enterer”. Supawadee’s father then donated a park called “Ampatagawan” (อัมพาฎกวัน), for the Bhikkhus to rest and take shelter in, as well as building a Vihara (shrine and salon) for the Monastics, as a temple within the grounds.The temple was named “Wat Machigaasandharaam” ( วัดมัจฉิกาสัณฑาราม). Pra Sutamma Tera was invited to be Abbot of the temple. Mr.Sujidtaprahma, who was very well known for being a person who would g out of his way to help others, and a good hearted generous fellow, would ask people on his selling rounds if anyone was going the same way and wished to hitch a ride with him. Sometimes there would be as many as a thousand people wishing to accompany him, which he never refused, always fulfilling their wishes, regardless of if they were followers of the Buddha like himself or not. 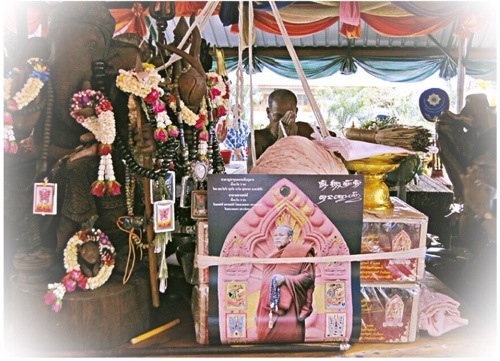 The many people who got to ride with him noticed the amazing power of Metta Mahaniyom of his daughter Nang Supawadee, whose blessings had caused her parents to become wealthy merchant moguls, and thus began to worship her as a cause of good fortune in selling and business matters. After many years, Sujidtaprahma and his wife Mrs Sumanta became old and passed away – their blessed daughter Supawadee also became old and eventually had to pass on to the next life, and left her body behind. But her legend lived on in the hearts for all the people who had adopted her as the patron saint and magical deva of all merchants, praying to her and making offerings to increase merit and receive great fortune in business dealings.Anyone wishing to have good luck in their sales would seek out an image or statue of Nang Supawadee and make Pojja offerings to her, inviting her spirit to come and reside in the statue or image, and bring them luck, as Supawadee had always done whilst riding on her father’s cart. All of 4 different castes of the Indian Hindu caste system adopted the practice; Brahmins, Royalty, Medics, and even Sudhras were seen to worship and respect Nang Kwak. The practice of making Bucha to Nang Kwak became ever more widespread, due to tales of many merchants practising Bucha Nang Kwak, and becoming extremely wealthy; This caused people in all four directions of the compass to adopt the practice. First of all before anybody, the Brahmins used it for their own business, but when they saw that people in Thailand believed in the powers of Nang Kwak, they began to make the statues here too, chanting and invoking the kata and blessing the statues to sell to other Thai Merchants for making Bucha to.Nang Supawadee then received her new and more commonly know name, due to her sitting and waving position in the new statue form “Nang Kwak” (waving lady – Kwak means to wave and beckon with the hand). 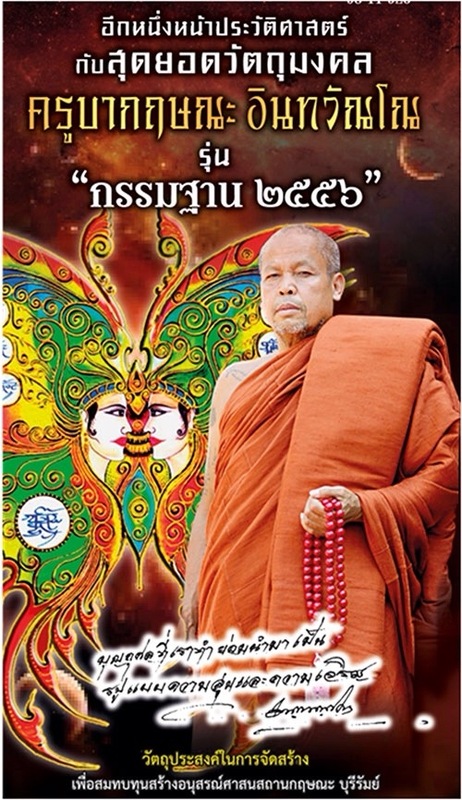 The objectives of Kruba Krissana Intawanoh’s 2556 BE Kammathana edition, include using the funds to donate to the commemoration of religious holy places and temples, in and around Buriram. And to produce interest and build practice, in the Buddha Dhamma. 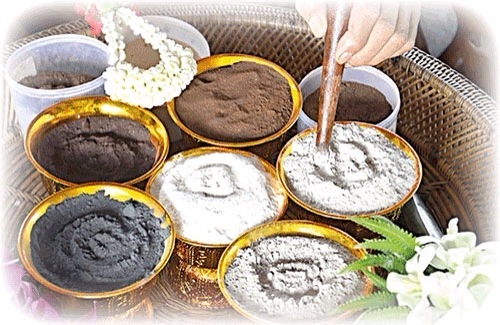 The sacred Muan Sarn Earthen powders, were amassed together for the great Puttapisek ceremony and under masterful eyes to ensure that the ritual followed exactly as prescribed by ancient Wicha knowledge.